George Herbert Walker Bush is a traitor. On Friday November 30th, the former treasonous President George H.W. 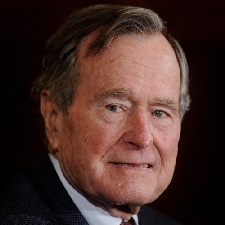 Bush passed away at the age of ninety four. While the establishment celebrates the life of the former president and Americans line up to mourn their fallen leader, the facts that are being reported in the mainstream media are far different than the legacy he is leaving behind. George Herbert Walker Bush was born on June 12, 1924 in Massachusetts to Prescott Sheldon Bush and Dorothy (Walker) Bush. Shortly after his birth, the family moved to Connecticut where he began his formal education at Greenwich Country Day School. At the age of eighteen, Bush joined the U.S. Navy. During his tenure in the Navy, Bush was stationed with Torpedo Squadron 51 aboard the USS San Jacinto. On August 1, 1944 his unit launched an operation against the Japanese in the Bonin Islands. On September 2, 1944, Bush’s aircraft was downed leading to the death of eight Navy airmen, leaving Bush as the lone survivor. The episode later became known as the Chichijima incident and led to the future president being hailed as a war hero. Upon graduating from Yale, Bush began his career in politics and was elected chairman of the Harris County, Texas Republican Party in 1963. Three years later, Bush was elected to the US House of Representatives, marking the beginning of a meteoric rise which resulted in him being named director of the Central Intelligence Agency in 1976. As Director of the CIA, Bush was responsible for overseeing the payment of hundreds of thousands of dollars to Panamanian leader and suspected cocaine trafficker, Manuel Noriega. Although Bush claimed he wasn’t aware of Noriega’s illicit activities until 1988, the CIA’s involvement in Latin America would eventually in a national controversy during the Reagan administration, in what became known as the Iran-Contra scandal. Four years after serving as the director of the CIA, George H.W. Bush was elected Vice President of the United States. Serving under former President Ronald Reagan, Bush kept a low profile and avoided making any key policy decisions or criticisms of the Reagan administration, but attended a large number of ceremonies and public events. In 1988, Bush was elected president defeating Michael Dukakis of Massachusetts. Within his first year in office, Bush’s approval ratings began to slip due to his inability to deal with Panamanian leader Manuel Noriega. Bush responded by deciding to invade Panama, and on December 20,1989 he deployed 25,000 troops to the tiny nation. Bush justified the invasion— code named operation just cause— on the grounds of national security. The president mislead the country by claiming Noriega had threatened the US, a claim which turned out to be untrue. After two weeks the conflict ended, resulting in the deaths of twenty American soldiers and as many as 2,000 Panamanians. Less than a year after the invasion of Panama, Bush once again found himself responding to another foreign policy debacle. On August 2, 1990 Iraqi leader Saddam Hussein began an invasion of nearby Kuwait. In response, President Bush and the American media used the testimony of a 15-year-old Kuwaiti girl, known only by her first name of Nayirah to justify US intervention in Kuwait. However, Nayirah was later discovered to be the daughter of a U.S. ambassador, who was being coaxed by military psychological operations specialists. In 1991, Bush gave his infamous ‘New World Order’ speech, which many people believe signaled the beginning of the PNAC plan also known as the Project For a New American Century. In other words, Bush outright rejected his nation for the preeminence of the United Nations. After leaving office in 1993, George H.W. Bush retired with his wife Barbara and built a home in a community near Houston, Texas. Though retired, the former president would still face controversy. In 1999, Former Brigadier General Russell S. Bowen published a book entitled, “The Immaculate Deception — The Bush Crime Family Exposed.” In the book General Bowen details the Government’s alleged role in covering up Bush’s role in the assassination of John F. Kennedy. Last year, during the height of the #MeToo movement, at least five women women claimed they were abused by the former president. In an interview with Time Magazine, a woman named Roslyn Corrigan claimed Bush sexually assaulted her in 2003 when she was only 16-years-old. At least five more women have accused Bush of sexual assault, including an unnamed Michigan woman who came forward claiming the former president groped her in 1992 at a campaign event. Actress Heather Lind also stated, in a now deleted Instagram post, that Bush groped her during a photo-op in 2014. Perhaps, instead of blindly praising a documented criminal, Americans should consider asking themselves what other crimes the US government and the media are covering up for the former president. 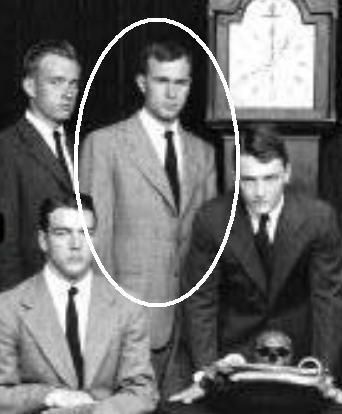 The Bush family had a long history at Yale, with both George Senior and George W. Bush being part of the Skull and Bones society. The Bush senior was the second president to be elected with a “Bonesman” history, with the younger Bush the third President. 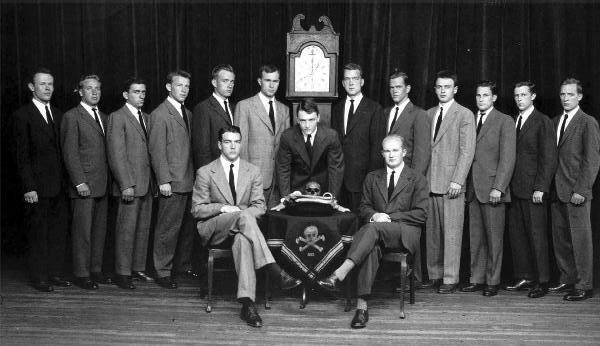 Skull and Bones Members, including George Herbert Walker Bush. Skull and Bones Member – George Herbert Walker Bush. George Herbert Walker Bush was also as a member and Director of the Central Intelligence Agency that is known to commit government cover-ups, drug smuggling and the assassinations of american citizens. He is also famous as the president who started the Gulf War bombing of Iraq. A war that his treasonous son George Walker Bush continued by lying to the American people about its dictator Saddam Hussein supposedly having weapons of mass destruction. The Bush political dynasty began with Prescott Sheldon Bush Sr. who helped Hitler’s rise to power. Prescott also became the Director of Union Banking Corporation when it was suspected of concealing Nazi gold during the Second World War. Both Prescott’s son, George Herbert Walker Bush, and grandson, George Walker Bush, became the 41st and 43rd Presidents of the United States, respectively, who both initiated wars with Iraq that profited companies with Bush family ties, such as Halliburton and KBR. CLICK HERE to read about the traitor Prescott Sheldon Bush. CLICK HERE to read about the traitor George Walker Bush. This entry was posted in Traitors and tagged George H.W. Bush, George Herbert Walker Bush, Traitors, Treasonous. Bookmark the permalink.